When written communication becomes more effective? When written communication is preferred? Or When written communication becomes more effective? 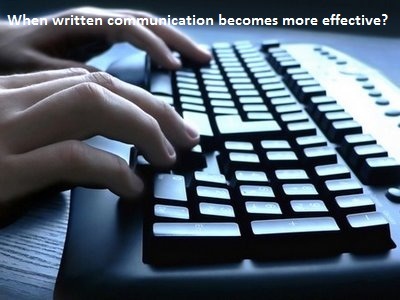 More effective written communication In the following situation written communication becomes more effective. 1. Conveying complex information: Written communication is the best way to represent any complex matter easily and attractively. When sender wants to convey complex information, written communication serves better than oral communication. 2. Permanent record: The documents of written communication are easy to preserve and act as a permanent record. Oral and non-verbal communication cannot be preserved. If it is needed, important information can be collected from the preserved documents. 3. Communicating with large audience: When audiences are large number and long distance, the speech of the communicator does not reach to all. In this situation written communicating is very much fruitful. 4. Longevity: Written document can be preserved for a long time easily. That is why; all the important issues of an organization should be back and white. 5. Delegation of authority: Written communication can help the authority to delegate the power and authority to the subordinate. It is quite impossible to delegate power without a written document. 6. Verification: The preserved information and messages can be verified easily. If there arises any misunderstanding, any party can easily verify the information from the preserved record. 7. Maintaining uniformity of application: When any information is to be disseminated or applied at different places, communicator should prefer written communication. Filed Under: Written Communication Tagged With: More effective written communication, When written communication becomes mere effective?, When written communication is preferred?